This simple salad always garners raves, and is a staple side dish in the Normandie house. Liang ban (涼拌) are literally just cool salads, vegetable or meat — with ingredients such as cucumber or chicken. This recipe has chili, as you’d expect from Yunnanese food. The combination of chewy and crunchy textures; and hot, salty, and sour flavours are irresistable. Yunnanese food isn’t as familiar in North America as the sweeter, more delicate, Cantonese-inspired Chinese food. It is often spicy and intense flavoured, and reflects the ethnically diversity of its province. This recipe is pretty easy to make, with minimal preparation and cooking. It stores very well, for at least a couple of days. We frequently serve it with Asian mains, anything from Korean barbecue, to gyouza. We’ve modified the recipe quite a bit from the original, including the use of black vinegar, and the proportions of the seasoning. Play with the tastes to suit yourself. It also works well with bamboo instead of mushrooms. 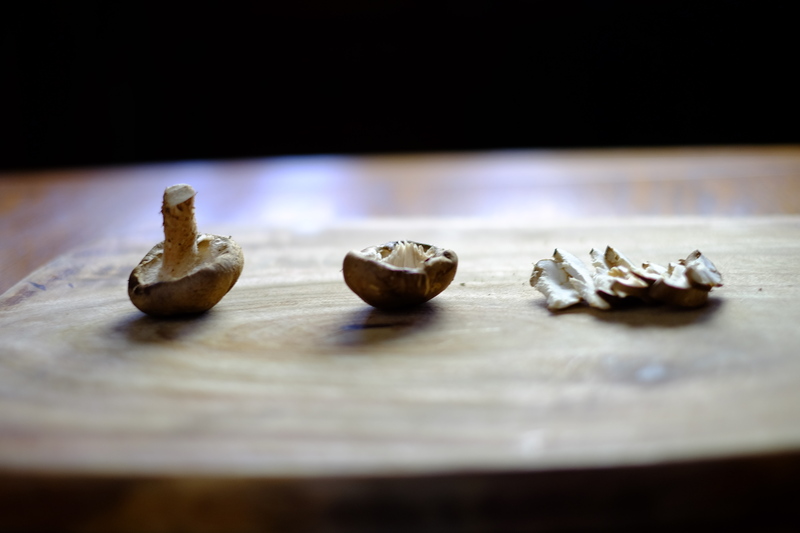 Wash the mushrooms and remove the stems. Slice them into thin (1/4 in ~ 0.5cm) slices. 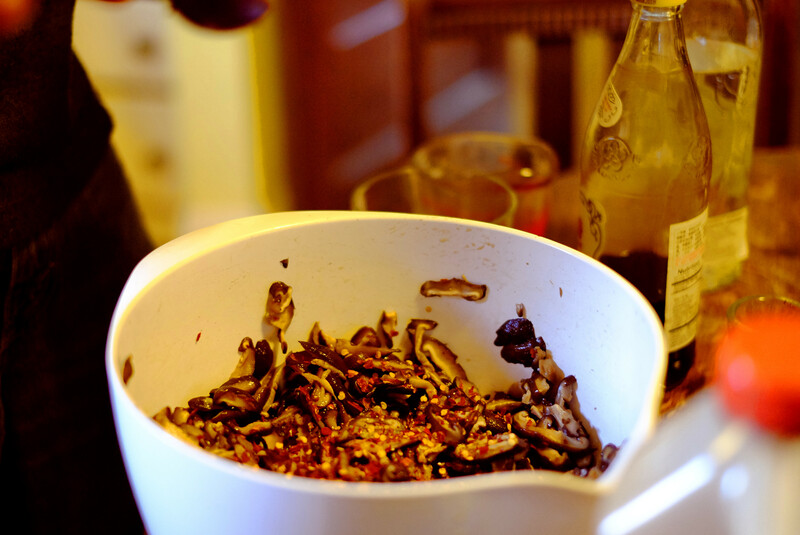 Blanch the mushrooms: boil a pot of water of high high heat, and then add the mushrooms. Cook until tender (5 mins), and then drain the water off, using a strainer. Let them cool down — you can rinse them with cold water, if you like. Meanwhile, chop the green onions finely. This means slicing the white ends lengthwise in half, or in quarters, and then chopping. 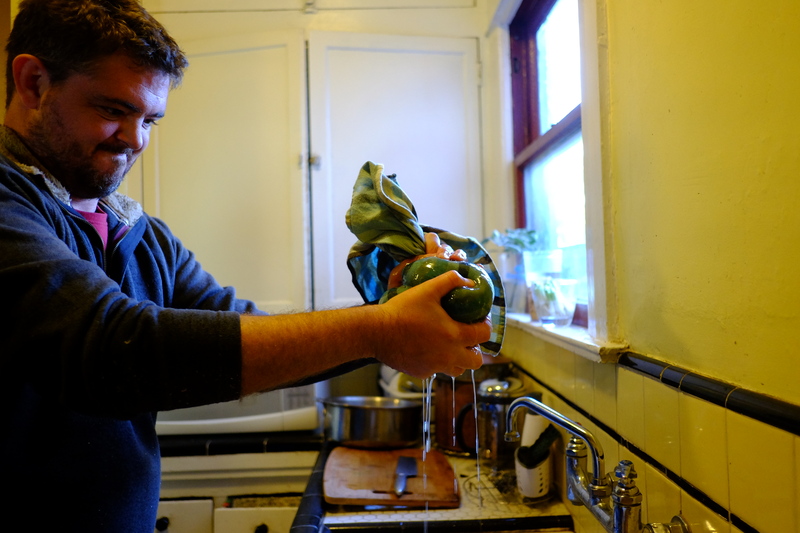 Once the mushrooms are cool (I never wait long enough, and always regret it), squeeze as much water as you can out of the mushrooms — a clean kitchen towel helps, but you can use your hands. Add the vinegar, soy sauce, and salt to the mushrooms. Adjust the seasoning to your liking (I usually add more vinegar at this stage, and maybe salt). Add the green onions and sesame oil, and taste again.